5289 N. Mills River Rd. North Mills River Recreation Area is a secluded jewel for camping in NC. Each campsite is only a short stroll from the swift, cool, shallow waters of North Mills River. Swim, tube, or fish for Rainbow, Brook and Brown Trout in a beautiful, forested setting. Within 30 minutes you will find downtown Asheville, NC and Hendersonville. In this area, hiking, camping, fishing and biking are the summer activities of choice! Or visit the Cradle of Forestry Heritage Site, located just up the mountain from the campground. Other campgrounds in the area include Davidson River and Lake Powhatan. 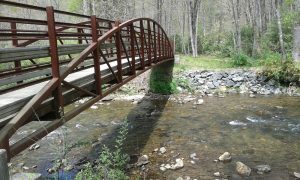 If you’re looking for outstanding hiking and mountain biking, look no further than North Mills River.